William Shatner knows the true secret of life. Not only have people been eating garlic for thousands of years, but they’ve also been pontificating about it for about as long. Below you’ll find some of the best garlic quotes from throughout the years. References to garlic appear in both the Bible and the Quran and it’s a long list of notable writers, chefs, and pundits who have have contributed famous quotes about garli over the centuries: Horace, Chaucer, Cervantes, Shakespeare, Shelley, Diat, and Dumas. 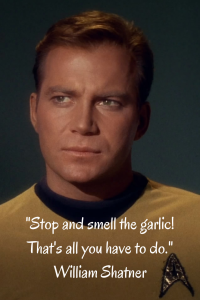 Even William Shatner has chimed in with a choice quote about garlic, and who are we to argue with Captain Kirk? There’s not really a neutral camp when it comes to garlic, with the world usually split into garlic lovers who relish and revel in the taste and smell and those who can’t get away from the “reek” of garlic fast enough. Most garlic quotes focus on the aromatic and pungent nature of garlic but some allude to its health benefits and its place in folklore and traditions over the years. You’ll find a little from both camps in the famous garlic quotations below; we’re obviously big fans of garlic but to each their own! “Shallots are for babies; onions are for men; garlic is for heroes.” – Unknown. “Garlic is the catsup of intellectuals.” – Unknown. “A nickel will get you on the subway, but garlic will get you a seat.” – Unknown. “Since garlic then hath powers to save from death, bear with it though it makes unsavory breath.” – Salerno Regimen of Health. “Most dear actors, eat no onions nor garlic, for we are to utter sweet breath.” – William Shakespeare, A Midsummer Night’s Dream. “Garlick maketh a man wynke, drynke, and stynke.” – Thomas Nash. “The air of Provence was particularly perfumed by the refined essence of this mystically attractive bulb.” – Alexandre Dumas. “What do you think? Young women of rank eat – you will never guess what – garlick!” – Percy Bysshe Shelley. “You’re a monster, Mr. Grinch, Your heart’s an empty hole, Your brain is full of spiders, You’ve got garlic in your soul, Mr. Grinch.” – Dr. Seuss.